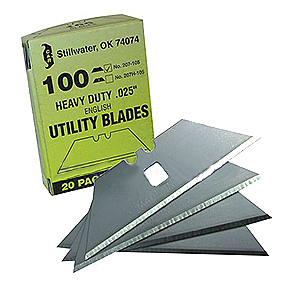 PRODUCT: 100 Pack Box of Heavy-Duty Carbon-Steel 2-1//2" Straight Utility Blades with Hole. Box Contains 20 packets of 5 blades per packet. Price/Box. Blade Size: .025" thick x 2-1/2" Long, 3/4" Wide. High Carbon Steel with ground Razor Edge. Fits all Modern Utility Knives.